Orwell’s central conceit is nothing if not timely. The game casts players as a fictional Big Brother, sifting through people’s private communications and picking info that might connect them to a terrorist plot. Months after its release, however, the game’s developers are worried about another timely issue: apathy. 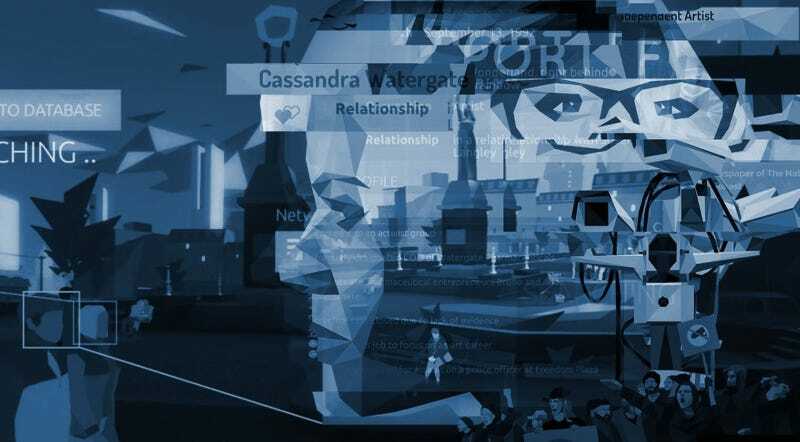 The team’s goal with Orwell wasn’t to impart a particular message, but simply to make people question potentially insidious frameworks underlying their everyday lives. But knowledge is one thing. What Taylor and Marx are worried about is whether or not people care enough to push back against increasing levels of surveillance in multiple facets of society, or even just to change their daily habits. Despite Snowden’s 2013 leak of classified documents that revealed the unsettling scope of the NSA’s domestic data collection initiative, the United States still possesses the most formidable government surveillance apparatus on Earth. While Congress reined in the NSA’s bulk data collection programs, its power and reach grew in other ways after the public found out about it. Meanwhile, recent documents brought to light by Wikileaks suggest that the CIA has means by which to exploit all sorts of modern communication devices, though there’s no evidence they’ve been weaponized against US citizens. Outside the government, companies like Facebook collect unprecedented amounts of data about users’ activities, preferences, habits, political affiliations, general locations, and more, which they feed to corporations who are, to put it kindly, not very concerned with people’s well-being. Oh, and Congress is pushing to allow internet service providers to sell users’ data without permission. Despite all this, people are acclimating, passively normalizing the idea of a surveillance state simply by letting it exist in the background of their lives. For some in marginalized groups, activism, and other high-risk positions, surveillance is an everyday concern. Others, however, are privileged in that they don’t have to be so vigilant. Getting people to care when they don’t feel directly affected by something is just one piece of the puzzle. Protecting yourself from surveillance and data collection takes effort. Modern existence is about communication and convenience, and the people who want to keep an eye on us 24/7—whether affiliated with the government or major corporations—benefit from that. Even Taylor and Marx don’t always practice what they preach. Nevertheless, Taylor and Marx still believe in the power of games to help people see the world around them in a new light. Every bit counts, and all these setbacks mean is that their work is far from done.